Relax Arachnophobes! Need to safely catch a false widow spider? Help is close at hand, or better still, arms length! 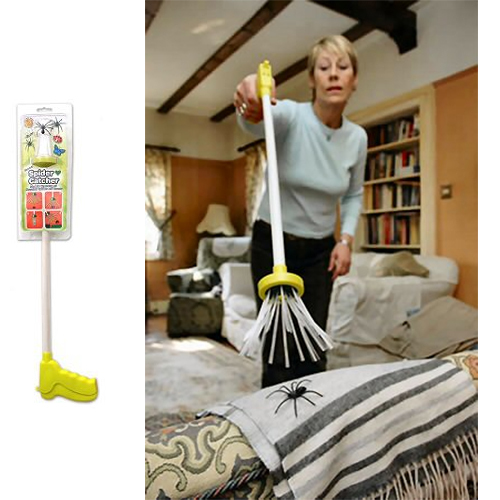 The Spider Catcher is an innovative new product which uses two sets of bristles to gently catch the spider or bug, carefully trapping it until you decide when and where to let it go. Because of it's flexible bristles and long reach, it can get into high corners and awkward spots to capture those pesky little beasts without you having to go near them. No potentially harmful chemicals, no thong hurling, no "splats" on the wall - No Worries ! If you don't like spiders in your house but you don't want to kill them either, then the Spider Catcher is just the right gadget for you. The Spider Catcher allows you to pick up spiders and other bugs while keeping a safe distance. The spider is not harmed and can be released into the garden where it will continue to be a beneficial member of your local ecosystem. The PROBLEM: Balancing on beds and wardrobes trying to remove spiders from your children's bedroom, only ever managing to chase them into corners and not wanting to harm them? Catching spiders is not easy, and it is difficult to pick one up without killing it. If you are afraid of spiders, you are not going to want to pick it up, and you are probably not that keen on harming it either. Swatting spiders is not that friendly, and is not so good if you have just redecorated your kitchen. Chemical alternatives, such as sprays, can be noxious, and no-one really likes the idea of inhaling whatever is contained in the spray bottle. The SOLUTION: Our Spider Catcher is a new product that enables you to catch spiders in your home and release them into a garden unharmed. We have used Spider Catcher on hundreds of spiders and we have never harmed a single spider. The Spider Catcher is so gentle, it can even catch butterflies and moths causing no harm to their delicate wings. The 65cm long arm keeps you at a safe distance and can reach ceilings and corners. In fact, the Prince of Wales was so impressed with Spider Catcher, that he sent a letter congratulating the its inventor, Tony Allen, on his idea. HOW IT WORKS: Squeeze the handle to open the bristles. Place over spider and release the handle. The Bristles close around spider, capturing it for safe removal. Can be let go outside, or released into a container. Can also catch wasps, moths and other insects. When you capture a spider, they generally curl up as a defence mechanism. Always make sure you pickup the spider correctly i.e. making sure that all the bristles surround and catch it, and to perfect your technique use the fake plastic spider to pick up from awkward places i.e. corners. More about spiders: Spiders are ancient animals with a history going back many millions of years. They have always been with us, an ancient source of fear and fascination. They are abundant and widespread and are natural controllers of insect populations. Wherever you live, you're always close to a spider. Spiders grow by periodically shedding their semi-rigid external 'skin' or cuticle of semi-rigid chitin and replacing it with a new larger skin they have grown underneath the old one (this is called ecdysis or moulting). This process includes replacement of every hair on the body. Once they are mature most araneomorph spiders stop moulting. However, female mygalomorph spiders moult throughout life, although at longer intervals as they get older. This allows some species, particularly tarantulas (Theraphosidae), to grow very large. Most araneomorph spiders (orb weavers, huntsman, etc.) live from one to three years. Mygalomorph spiders (trapdoors, tarantulas) generally live much longer. Some large tarantulas species (Theraphosidae) take six to eight years to mature and live 20 years or more. A long life and continuing moulting and growth allows some of these species to grow very large - the legs of a large goliath spider (Theraphosa blondi) may almost span a dinner plate. Female spiders generally live longer than males, this difference being especially notable in spiders like mygalomorph spiders - e.g., male funnelwebs mature in two to three years and then die about nine months later; whereas females mature in three to four years but may live for many years (six or more) after that. During the moulting process, which may take many hours, the spider is in great danger from predators, being soft-bodied and unable to move until its new cuticle has hardened. For this reason moulting is often done at night hanging safely in mid-air from a silk line; or sealed within a silk retreat or moulting chamber, e.g., in a curled leaf, a burrow, or under bark.